"Alexa, please crank Metallica up to 11"
Amazon Alexa offers your home a lot of utility and convenience. 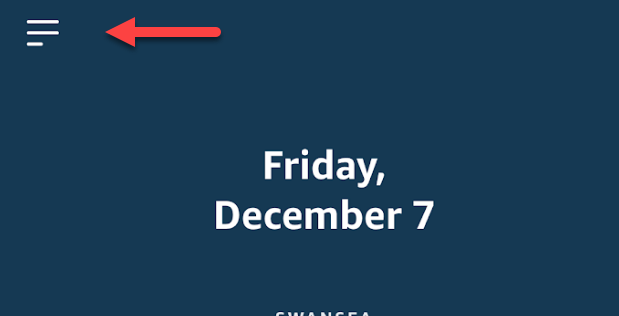 From the artificial intelligence that can help you manage your schedule to the myriad of skills that can make your day easier or more enjoyable, there are so many features to figure out that it can become a little overwhelming. While some people will buy an Amazon Echo for the Alexa capabilities, it also performs quite well as a speaker for your favorite tunes as well. Below we’ll cover several ways to stream music through the Amazon Echo the easy way. There are a variety of ways to access the Amazon Alexa settings, but this guide will focus on the process using an iOS device. Following the steps should be nearly identical on Android, and about the same using the web portal at alexa.amazon.com. Follow the steps below, and you’ll be up and running and ready to stream in just a few short minutes! Also, be sure to check out our post on how to listen to Audible audiobooks on your Echo device. Before we get started with the music aspect of your Amazon Echo, you’ll need to make sure you have the Amazon Alexa App. Navigate to the App Store (iOS) or Play Store (Android) and download the app in the picture below. If you have an Amazon Prime account, you’ll automatically have access to millions of different songs. Upgrading to Amazon Music Unlimited ups that amount to 10s of millions of tracks, encompassing pretty much any genre and artist you can think of. Whether you’re using Amazon Prime or Amazon Music Unlimited, the process for getting the streaming service up and running is pretty much the same. You’ll also be able to connect services like Spotify, Pandora, or iHeartRadio following roughly the same process. Step 1. Open the Amazon Alexa app and open the sidebar using the menu button at the top left of the screen. Step 2. 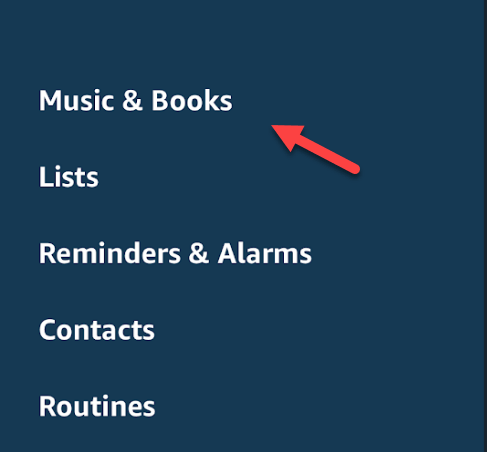 Select the option for Music and Books. Step 3. There are two main parts to the next menu: device selection, and service selection. At the top of your screen, you can choose the Echo device that you’d like to stream to. 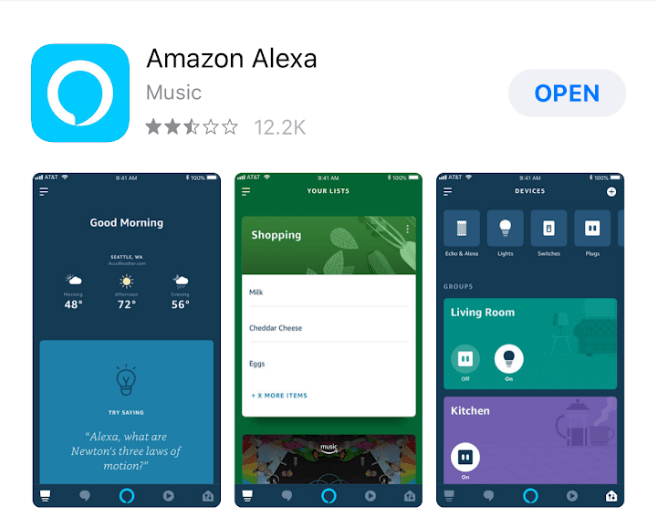 Below, there is a large list of compatible music services that you can connect to and control through the Alexa app. For the purposes of this guide, we’ll use Amazon’s own music service. Step 4. The content of the next screen will depend on what service you selected, but for Amazon Prime, you’ll have the ability to choose between radio stations or playlists. Choose the content you like and your music should start streaming to your Echo device! Once you’ve connected your accounts and have synced up the Alexa app with your chosen Echo speaker, you can bypass these steps and use commands like Alexa, play iHeart Radio, or Alexa, play Spotify. 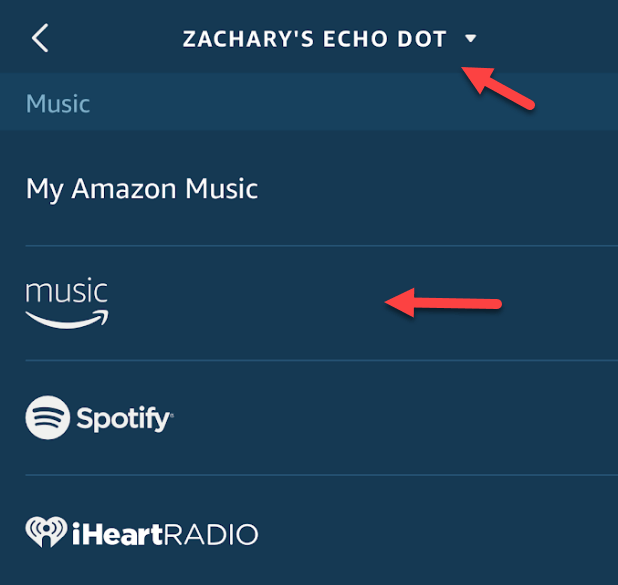 Once your Echo is plugged in and online, you can actually bypass the Alexa App entirely and use a Bluetooth connection to play music through your phone. This essentially allows you to pass all audio from your phone through the speaker, which opens up the ability to stream audio from any service you can access on that device. Step 1. 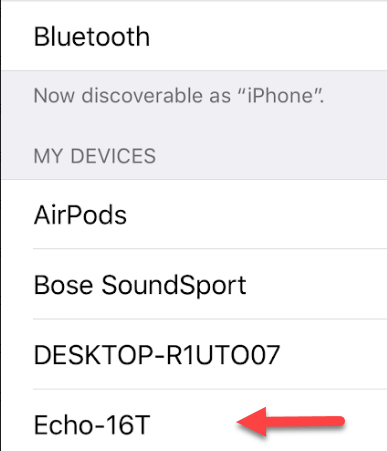 Set up Bluetooth pairing by saying “Alexa, pair,” while your mobile device is nearby. The next part of the process is to navigate to the Bluetooth menu on your phone. 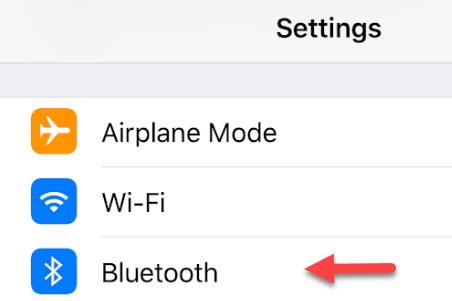 The steps below is for iOS, but Android should generally be some sequence of opening Settings and navigating to the Bluetooth menu. Step 2. Open the Settings app. Step 3. Tap on Bluetooth. Step 4. If your Echo device is in pairing mode, you should see it listed on this screen under Other Devices. Tap on it to add it to the menu, and ensure your phone is connected to the smart speaker within the Bluetooth list. Step 5. Find the music you’d like to play through your speaker, and enjoy your favorite tunes on your chosen Echo device! Once you’ve gone through this initial setup process, you can connect or disconnect your Echo device to your phone with voice commands like “Alexa, connect to [name of device],” or “Alexa, disconnect from [name of device]. While there are definitely a few hoops to jump through in order to get your Amazon Echo set up to stream music, you’ll generally be able to play tracks and adjust settings using just your voice moving forward. Since the Echo is essentially a smart Bluetooth speaker, you’ll also be able to hook it up to your computer or any other media player that is compatible with Bluetooth in order to play audio across all of your devices. Enjoy!